You'll find here TBS INTERNET discount codes for your certificates purchases. You own currently valid SSL certificates issued by Symantec, Thawte or Geotrust? TBS INTERNET offers 5% discount to get a replacement GlobaSign certificate. Fill in the order form and indicate your product's discount code (see here under) in the provided box. You purchased a Comodo SSL certificate? 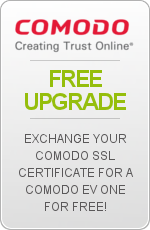 Ask for a free upgrade and get a Comodo EV certificate! Once your Comodo SSL certificate delivered, go on your product's status page and click the button: "Ask for your free EV certificate". Your certificates will soon be expired? Order your renewal from 90 to 60 days before your certificate's expiration and benefit from a 5% or 10% discount. Nothing! If your certificate is eligible, the discount code will automaticaly be added to your renewal form.